I am continually pulled into anthropology's force field because it is not monolithic. Multiple, variable, dynamic, and diverse are its broad characteristics. Rather than relying on "it" to designate anthropology, I search for another placeholder. "They," perhaps? This very venue, the AnthropologIES Blog, already acknowledges and highlights the multiplicity and diversity of the discipline, subject, and discourse through which humanity can be studied. Looking into the various ìsubfieldsî or ìsubdisciplinesî as they are so earnestly divided, one finds that visual anthropology, for example, is as variable and multifaceted as its parent. Visual anthropologies range between investigations of the visuality of human life and how anthropologists visualize any facet of anthropologies (Banks and Morphy 1999; Wright 1998). Here, I discuss archaeological virtual reconstruction as one of many visual anthropologies, and one which receives less face time than other more well known and ëtraditionalí visual anthropologies. Particularly, my work focuses on virtual reconstructions of architectural remains recovered and understood archaeologically. Thus, here I focus on buildings as visual culture. Archaeological virtual reconstruction encompasses a breadth of methodologies that contribute to, as the term implies, reconstructing a building in three-dimensional virtual, digital space (Figure 1). Most are familiar with the end-products of virtual reconstruction as featured in various documentaries and historical productions on television. This is not the venue to discuss the accuracy or faithfulness of such popular outlets for virtual reconstruction; however, suffice it to say, this topic is intensely debated within the virtual archaeology literature (see Baker 2007; London Charter 2009). Rather than becoming mired in sloppy popular media creation, I hope to convey that virtual reconstruction as a process is a means to better understand all of the following: architectural design, aesthetics, and general visuality of past peoples as well as how archaeologists interact with visually representative datasets, how visual pictures or videos are produced and manipulated for research, educational, and published applications, and how creativity plays a large role in not only this one anthropology but all anthropologies. Figure 1: Virtual reconstruction image of Plaza A-III of Xunantunich, Belize superimposed over an archaeological site map. Architecture is undeniably visual and anthropological. At both fundamental and grandiose levels, humans interact with the world through buildings and structures. Facilitating and impeding movement, regulating and encouraging relationships, perpetuating and challenging aesthetic styles, architecture from dwellings to monumental temples resonates with visuality and humanity. Virtual reconstruction of buildings provides opportunities to elucidate these important qualities through both visual product and process. My first virtual reconstruction experience (McCurdy 2010a) happened to concern the architectural remains of a palace complex (Plaza A-III) at the archaeological site of Xunantunich (Yaeger 2003; 2010; see also LeCount and Yaeger 2010) (Figure 2). Archaeologists uncovered several construction and occupation phases at the palace over many excavations periods (Mackie 1985; Yaeger 2003). After collecting data using 3D survey and mapping techniques at the remains, I created a virtual reconstruction incorporating each projected construction phase using computer-aided design (CAD) software (Figure 3). Plaza A-III, while preserved well by tropical forest standards, is not in good condition. Due to the fact that buildings do not survive in their original, occupied state, virtual reconstruction entails some hypothetical reconstitution of form. This typically includes reconstructing the tops of walls, doorways, vault systems, and roofs; most of which have fallen from the real structures at Xunantunich. Much of this work is done by use of analogies to other buildings of similar type and close proximity that survive in better condition or publications of highly experienced archaeologists with expert knowledge in architectural form and aesthetics (e.g. Loten and Pendergast 1984). Figure 2: Remains of Plaza A-III a Xunantunich, Belize, facing north and Structure A-11. Figure 3: Geometric reconstruction in progress using AutoCAD 2010 software. 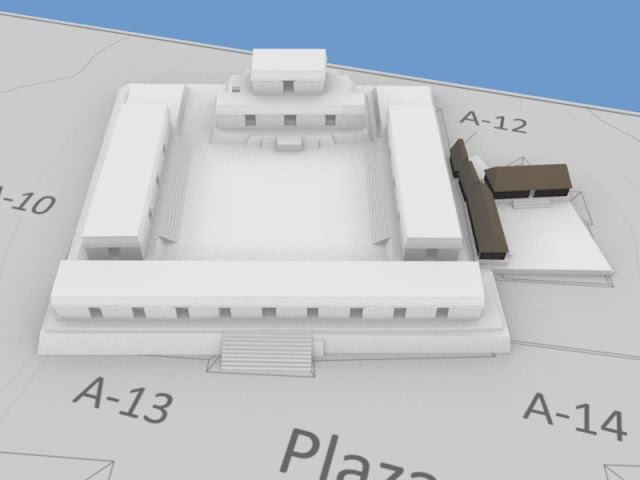 As this particular virtual reconstruction progressed, I realized that some previously published archaeological interpretations of Plaza A-III's architectural design were not supported by the physical remains. Thus, I was able to more accurately revise the architectural sequence (McCurdy 2010a). Architectural sequences bear significant import to the archaeological understanding of political upheaval at Xunantunich in the Late Classic Maya period (AD 600-800). As authority changed hands at Xunantunich, the palace was relocated (to Plaza A-III) and remodeled several times (Leventhal 2010). The modifications involved designs to restrict access to private areas of the ruler's residence to increase security and protect the ruler (Yaeger 2003; 2010). Video 1: Animated virtual reconstruction and revised architectural sequence of Structure A-11 at Xunantunich, Belize. Additionally, several rooms demonstrate ritual termination and abandonment (Yaeger 2003; 2010; personal communication 2011). These events of Late Classic Xunantunich, physically evidenced in architecture and reconstructed virtually, reflect human relationships at multiple levels, physicality and mentality of space and architectural design, visual culture and styles, environmental interactions, and other facets yet to be explored. Principally, I have focused my efforts on elucidating and improving the experience of virtual reconstruction. As my master's thesis project, I developed a protocol to create and standardize records of the virtual reconstruction process (McCurdy 2010b). This work entails organizing and manipulating large amounts of data, archaeological interpretations, and hypothetical reconstruction alternatives. The protocol I developed incorporated a visual interface to record decisions made throughout the reconstruction as a way to build transparency into the process from the start (McCurdy 2010b). Manipulating virtual architectural forms is an act impregnated with visual aesthetic preference, interpretive bias, and relative degrees of creative license. A transparency protocol, as a fancy way to term a record keeping log, makes each decision plain and open to consideration by other eyes and minds. By maintaining the log as an integral part of the process, reflexivity is built in and makes for simultaneous critical self review. Virtual reconstruction projects are better for transparency protocols because as a visual product themselves, they provide direct evidence of the path of decision making that emerged throughout the reconstruction. Thus, critical commentary and potential improvements can be made to both the virtual product and process. Once a record has been made of the process, the possibilities to understand practice aspects of such methodologies open up. Just as one might ask questions about the decisions made by ancient designers in constructing a building, one might investigate how archaeologists make decisions to reconstruct that same structure in virtual space. Decision of presentation, for example, can yield insight into target audience and interpretative perspective. Issues of intent and agenda can be accessed through transparency data created and completed alongside the reconstruction. This reflexivity and review potential is important because it is lacking in so many popular applications of virtual reconstruction. As archaeologists and anthropologists invest in visual anthropologies, reflexivity and critical review are paramount to the validity and perpetuation of such studies. I particularly wish to note the creativity that is brought to virtual reconstruction and all visual anthropologies. While the subject matter can be intensely creative, many of the methodologies associated, such as cinematography as a well known example, are embedded in creativity. Artistic creativity is an important facet to such work; however, Hallam and Ingold (2007) also argue that acts of decision-making make up a more accurate and inclusive understanding of creativity. Each decision is a creative enterprise composed of alternatives and choices made concrete through actualized acts of decision. Transparency protocols of virtual reconstructions record and display such creativity for critical consumption while ethnographic films, research publications, and conference presentations also provide a window into these decisions and the creativity of anthropologies. This creativity of anthropologists, be it visual or otherwise, is how we learn of anthropologies. Creativity is what makes anthropologies diverse and multiple. This is what continues to pull me in. Banks, Marcus and Howard Morphy. 1999. Rethinking Visual Anthropolog. Yale University Press, New Haven. Baker, Drew. 2007. Towards Transparency in Visualisation Based Research. Paper given at AHRC ICT Methods Network Expert Workshop: From Abstract Data Mapping to 3D Photorealism: Understanding Emerging Intersections in Visualisation Practices and Techniques. June 19, 2007. Hallam, Elizabeth and Tim Ingold. 2007. Creativity and Cultural Improvisation. Berg, New York. LeCount, Lisa and Jason Yaeger (eds). 2010a. Provincial Politics: The Classic Maya Center of Xunantunich and its Hinterland. University of Arizona Press, Tucson. Leventhal, Richard. 2010. Changing Places: The Castillo and the Structure of Power at Xunantunich. In Classic Maya Provincial Politics: Xunantunich and its Hinterlands, edited by Lisa J LeCount and Jason Yaeger, pp. 79-96. The University of Arizona Press, Tucson. London Charter Initiative. 2009. The London Charter: For the Computer-Based Visualization of Cultural Heritage Second Draft. February 2009. Loten, Stanley and David Pendergast. 1984. A Lexicon of Maya Architecture. Toronto: Royal Ontario Museum. Mackie, Euan W. 1985. Excavations at Xunantunich and Pomona, Belize, in 1959-60. Oxford: BAR International Series 251. McCurdy, Leah. 2010a. Virtually Reconstructing Maya Architecture: Discoveries of Virtual Artifacts. Paper presented at the 1st Annual South-Central Conference on Mesoamerica, San Antonio, Texas. -----2010b. Visualising Architecture: The Experience of Creating Virtual Reconstructions. Unpublished M.A. Thesis. University of York. York, England. Wright, Chris. 1998. The Third Subject: Perspectives on Visual Anthropology. Anthropology Today 14(4): 16-22. Yaeger, Jason. 2003. 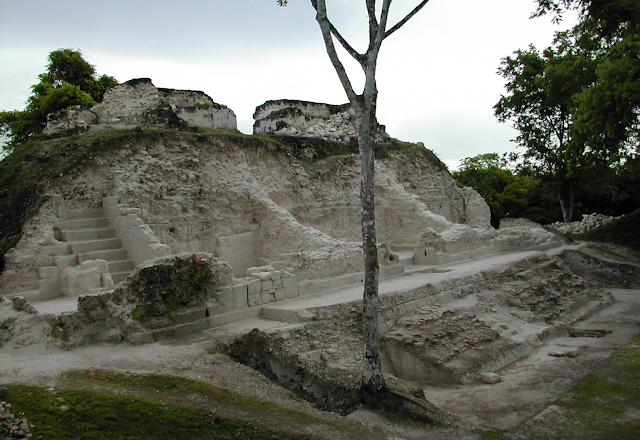 Revisiting the Xunantunich Palace: The 2003 Excavations. Report Submitted to the Foundation for the Advancement of Mesoamerican Research, Inc.
-----2010. Shifting Political Dynamics as Seen from the Xunantunich Palace. In Classic Maya Provincial Politics: Xunantunich and its Hinterlands, edited by Lisa J LeCount and Jason Yaeger, pp. 145-160. The University of Arizona Press, Tucson.